It’s not for just anyone or anything that I will put on a suit on a 90-plus degree day, and yes, you can consider the initial public offering of Fusion-io one of those things. Plus? I’ve never been to an IPO before. This morning I ventured down to lower Manhattan to witness the Utah-based company do something its CEO David Flynn swore to me in December that he would not be doing in 2011. But? Things change. After pricing at $19 a share yesterday, the shares opened at $25.30. 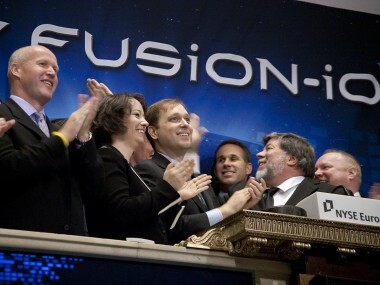 Fusion did all the usual things you’d expect from a company wanting to make a splash with an IPO. 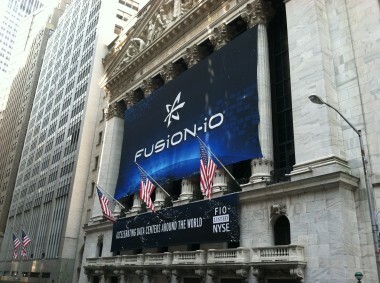 A big banner with the Fusion-io logo adorned the outside of the NYSE building. And Steve Wozniak, the Apple co-founder who is a Fusion-io investor, director and chief scientist was on hand for the obligatory bell-ringing ceremony. After the bell, eager traders crowded around the Barclay Bank post to await the opening of trading, which took place a little after 10 AM New York time. Woz purchased the first 100 shares when trading opened. At noon Eastern, Fusion shares are holding up, trading at $23.92. As trading debuts go, it’s certainly no LinkedIn, but then again, on the day LinkedIn opened the Dow Jones Industrial Average closed at 12,605.32, nearly 600 points higher than its open today. Regardless, even at that price, Fusion-io is being valued at nearly $2 billion, or more than 50 times its fiscal 2010 revenue. Flynn’s next big task will be reporting quarterly earnings next month. Expectations for this company are high, so there’s a lot to worry about. Facebook and Apple combine for about 70 percent of sales but once they’re done building their data centers, they’ll more or less be done buying Fusion-io cards for their servers. And worse, 10 customers account for more than 90 percent of sales. The good news is that the company has 1,500 different end-user customers. Plus, it has its partners — Hewlett-Packard, Dell, IBM and SuperMicro — to resell its technology into their servers, and there’s lots of interest among financial institutions and other companies in speeding up the flow of data on their servers. It will be an interesting story to watch. Just moments after the debut in trading, I caught up with CEO David Flynn for a quick chat in the video below.